I woke up to a pterodactyl dancing on the roof over my bed. It turned out to be a stellar's jay pulling all the moss out from between the shingles. A pair of them have returned from wherever they go to nest to make sure I don't do any late sleeping in the near future. They make up for their abrasive squawking with the sheer beauty of their blue and black feathers - the crest of their heads does make them look ever so slightly like small pterodactyls. Small zucchinis are starting to form but no cucumbers yet that I can see. The one purple sprouting broccoli plant left over from last year (which I was greatly enjoying) is now completely infested with purple aphids. The chickens don't seem to mind but I do wish I'd had more than two small meals from it before the crawling army moved in. I am extremely grateful that I have grocery stores as a backup if this all goes pear-shaped. The more I observe the chickens, the less I think separates them from humans. 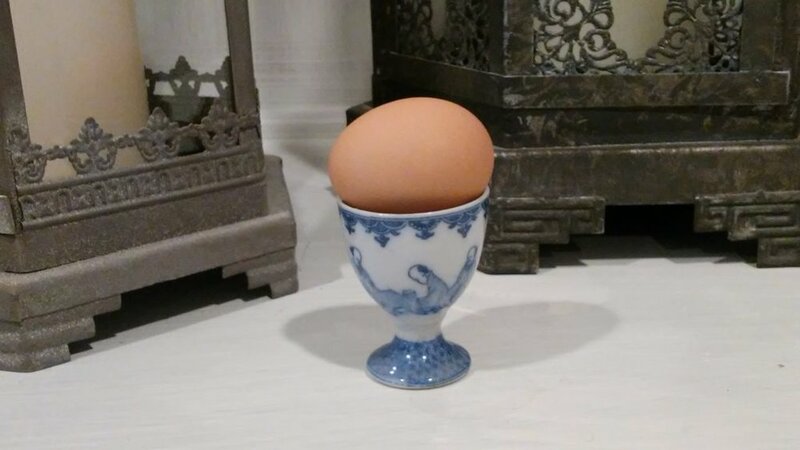 Petty jealousies, wanting what someone else has just because someone else has it and a perverse inclination to like the chicken that looks like you more than the one that doesn't. Poor Daisy is still under the evil influence of broody hormones and has been picking needless fights that leave everyone in a bad mood. Peony is broody as well but seems to have sunk into a general depression keeping her head down. They should both be coming out of it fairly soon - certainly the ceramic eggs they're sitting on aren't going to be hatching. Meanwhile the meadow is filled with dragonflies of all types and descriptions. From the house they appear as large as the swallows that are swooping higher up. Just now a zilliant red one landed on the old clothesline outside the window. It perched just long enough to be admired and zoomed off again. The blackberries that desperately need to be cut back are in full bloom and attracting everything from bees to deer. Most of the tree frogs in residence seem to have taken a vacation - hopefully not a permanent one. Sylvia is still in residence though, currently sunning herself on the flank of a beautiful turquoise ceramic pot. She looks like a molded decoration that has been added by the artist. The garden is only just beginning to produce. Peapods are coming along as is sprouting broccoli but no signs yet of zucchini. The tomatoes are beginning to form but it will be weeks yet before even the small, fancy ones are ready. There are certainly plenty of chores to do but not much that needs putting up for winter at this stage. I'm hoping to do some herbs this weekend and start in on cuttings. To make up for the disappointing cherry crop, the raspberries have been going above and beyond. For supper nothing beats a savory Texas biscuit shortcake. 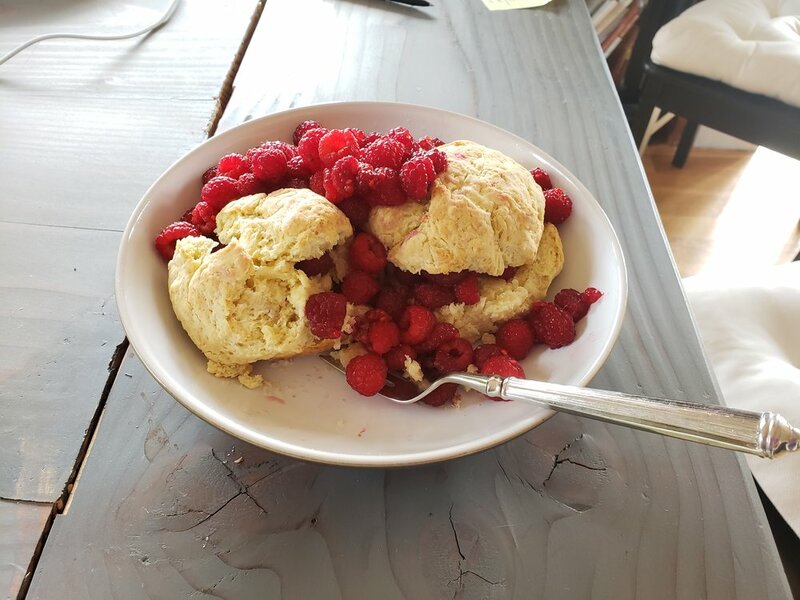 A little butter and raspberries between the layers and then the rest tossed over the top - not fancy in culinary terms but oh, so celebratory of summer! I’ll be making the last ice cream of the year this weekend – a repeat of the amazing blackberry from a few weeks ago. Fresh Himalayan blackberries from the field, eggs from the hens and lots of love stirred in. Ice cream tastes different when you know the name of the chicken that laid the egg. 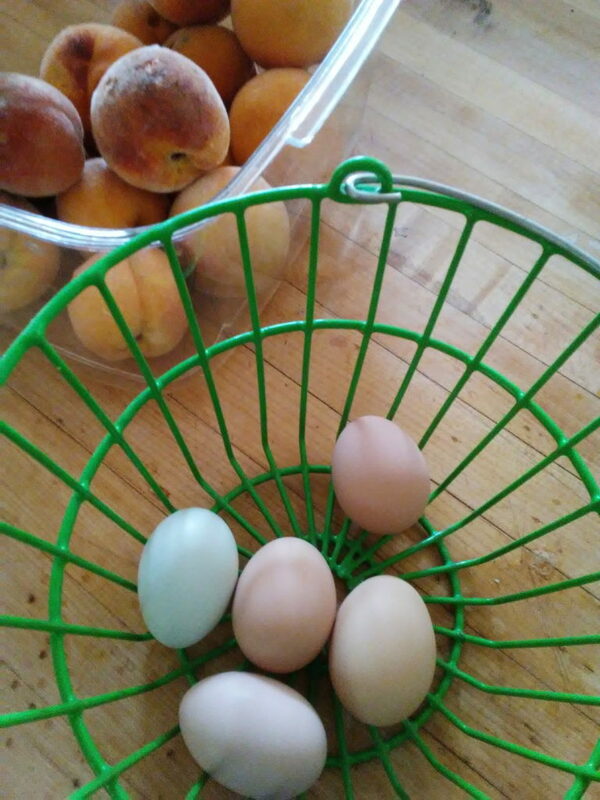 The chickens are positively blossoming – Maisy is over her bout of adolescent broodiness and Cleopatra deigned finally, to add a blue egg to the mix, nicely contrasting with all the shades of brown. Daisy and Cleopatra keep trying to escape the enclosure to go exploring. I think I finally understand why people buy halters for their chickens. The garden has not done well – too much heat without water, too much wind, and too many deer/rabbits. But I have a plan for next year that’s going to involve a lot of construction and plastic sheeting. Hopefully next year can free me from the grocery store for produce. The fruit trees though, have given abundantly. I picked the last of the peaches today, having dehydrated enough to get over a pound for the winter. The chest freezer is full of goodness and it’s going to be exciting to sit down to cherry fruit soup at Christmas. I’m looking forward to autumn and cooler temperatures. Hopefully it will be a time to get back to house renovations and writing now that the first year of Short Meadow is complete. I’m excited to use the new wood stove and think hygge thoughts! On Wednesday, just as it was getting dark, two family groups of coyotes gathered on either side of Short Meadow. They were probably at least a mile in either direction but when their voices rose in song they raised the roof. It was eerie and beautiful and I could have happily gone to sleep with the romance of it all. Ella had a different opinion. By the time I got her to settle down and my ears had stopped ringing from her vocal attempts to tell them to shove off, it was after 2 am. Ella is a sweetheart, but has very little sense of romance! And she doesn’t care for coyotes, racoons, the Post Office, UPS, FedEx, or squirrels. The chickens eagerly await the arrival of their walk-in run which appears to be delayed by a back-ordered part. They are unfazed by the coyotes’ singing or thunderstorms but when I brought in their new perching trellis they thought I was out to murder them. One day later though, and they are back to pecking my garden shoes most affectionately. The second attempt at tomatoes is coming along. The fresh batch of Cosmonaut Volkov has sprouted. I dearly hope that someday I inspire someone sufficiently to name a delicious tomato after me! So much better reach and longevity than a statue somewhere… in addition, having got the sudden inspiration from Gardener’s World, I hunted down a gunnera to put in a giant Costco pot on the deck – in the tropical corner. I’m hoping it will serve as an umbrella over the lounge chairs. Other garden priorities have shifted. The simultaneous blooming of an orange azalea in close proximity to lavender lilacs has my eyes hurting. Ripping out the front bed has just moved up to the top of the list. I got up early this morning to meditate and contemplate. I awoke to the sound of early morning birds singing into the darkness. The dawn chorus begins long before the sun makes an appearance! When the sky lightened it was still cloudy and cool - the mountains obscured by a band of dark gray. When I went down to let the chickens out I took with me a sprouting broccoli and a kale plant both of which had gone to seed. The chickens were thrilled. While I was in the chicken house tidying up, Daisy came back in to see what I was doing. When she saw there were no bugs in the offing she took advantage of the lonely grain basin and then cheerfully hopped back out to the greens and the other girls. A happy and cheerful chicken is a delightful thing. Later on the sky cleared and sunshine again flooded the orchard and yard. All the rose bushes have buds but only Jude the Obscure has aphids. My newly planted lewisia opened two flowers and is covered in buds like a delightful pin cushion. So far, it is uninterrupted by the rabbits. Deer spray will need to go on all things liberally and very soon. Things in the garden are really starting to leaf out and fill in the cracks. I want to get things into pots on the deck but it is still too early - they will sit there and pout if I do. I am gradually building up a collection of plants to make hedges with but I need to think of a more controlled way of doing that or they will all get run over by the lawn mower. The new chipmunk made sure I knew she or he was there and then practically made gestures at the empty feeder. She ran off when I began talking to her. She'd made her point. She was back poking her nose out from under a the leaf of a lady's mantle after I'd filled the feeder. After a little online research and the binoculars from the kitchen window she is a Townsend chipmunk. She knew that already. At the same time she was gathering seeds there was a new visitor to the feeder - an evening grosbeak. Really lovely with a dark yellow green breast, yellow marks around the beak and flashes of bright yellow under the wings. Our family is expanding rapidly. The crabapple at the end of the orchard is in full bloom, they are such lovely trees all the year around. “Analysis Paralysis” strikes as many gardeners as it does IT workers. Caught between big plans and no clear direction, frequently nothing at all happens. I’m as guilty as anyone, and moving to a new house/garden brings on a strong relapse. What colors do I want here? How will I use it? But sometimes… wonderful things happen by tossing carefully laid plans out the window and having no vision of the outcome whatsoever. When I packed up the old garden for moving, a bunch of unmarked and unknown bulbs went into a paper bag out of expediency (they were lucky to stay out of the compost bin!) Last fall, faced with fast approaching winter, no memory of what these bulbs were or what color I decided to just plant them in the woodland in areas where I didn’t think I was likely to build or put anything for quite awhile and just see what happened. If they didn’t survive, no big deal. If they did and were a rainbow of colors, well they weren’t going to spoil any emerging schemes by the house. And now, in March, the rewards are small treasures surprising visitors on a random path through the woods, sparkling with scent and color among vibrant moss. I couldn’t have made this much magic if I’d tried. I’m so glad I didn’t.